There has been a lot of talk about Ethereum and Initial Coin Offerings in the blockchain and cryptocurrency community lately. Many people from the mainstream are learning about cryptocurrencies because of Ethereum. But there's also another huge platform and digital currency in the space that just hasn't received as much recognition yet, the platform is called Stratis. Stratis is a Blockchain as a Service (BaaS) platform. Essentially they are similar to Ethereum but instead of running ICOs and focusing mainly on smart contracts, their concept is to have a multitude of features covering every possible need in the blockchain space, so they can offer their services up to other companies. Stratis is similar to a SaaS company but is specifically built to offer blockchain as their service. It should be noted here that I am an advocate of blockchain technology. The BaaS concept allows a company to come to Stratis and setup a blockchain on their own on the Stratis' platform without having to start all over and reinvent the wheel, so to speak. This allows any company in the world to quickly get and utilize blockchain. This is generally referred to as a sidechain. This means a blockchain that is built and operating as a branch off of another blockchain. It simplifies everything for the client company. 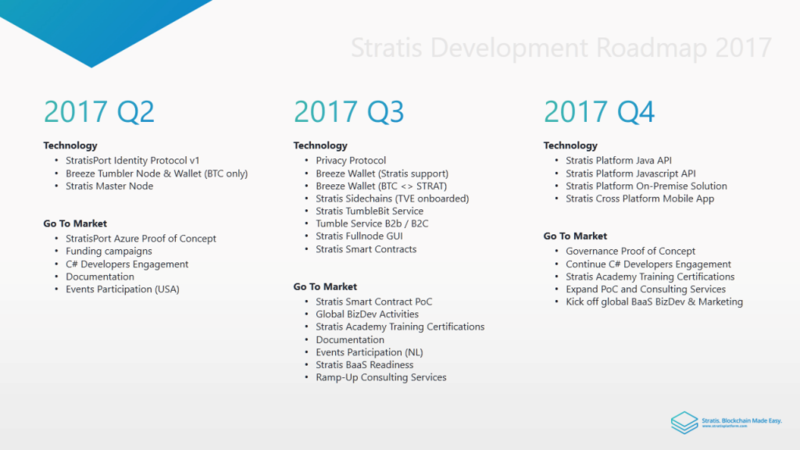 Stratis also has their own cryptocurrency called Strat. Strat fuels the Stratis Platform, like Ether for Ethereum. Strat is currently trading around $7.90 as of the time of writing. Typically, Strat is influenced by the ICO market, postively or negatively but speculators are betting heavy on Strat long term. Without being too technical Stratis also solves a number of problems that even Ethereum has not solved yet which has been made apparent due to recent network issues with Ethereum. Stratis leverages sidechains of their own to bypass scalability issues. For blockchain companies that are heavily reliant on tech, having a well rounded roadmap is a good sign. Stratis has been working hard at it, building their tech into one of the most powerful platforms in the space. The roadmap shows that they are well organized and have thought through a number of potential technical issues. The team appears to focus on longer term plans to make their platform robust, reliable and scalable. Here is a link to Stratis' full upcoming road map. Speculators are calling Stratis the next big blockchain platform because of its solid tech and scalability potential. The future looks bright for Stratis, which is currently the 10th must valuable cryptocurrency in the world based on market cap.